Leather couches or seats made of leather as opposed to cloth tend to be more comfortable and more durable. However, if you have pets, their claws may cause scratches or gouges that may result in issues both from a durability and aesthetic standpoint. What can you do to go about protecting leather surfaces from your favorite feline or canine friend? For the most part, the first step in protecting leather furniture is to train your dog or cat to stay off of the couch. If you have a cat, you may be able to discourage it from clawing at the couch or love seat by giving it a scratching post to use instead. You may also be able to put aluminum foil near the furniture or spray it with anything that has a citrus scent. If you have a dog, a little obedience training can teach it to sit by the couch without jumping onto it. 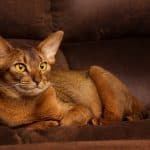 If you don’t like the thought of your pet being too far from its family, you can put blankets or covers on sections where you want the animal to sit. Over time, it will learn that it can sit only where there is a blanket or some other cover. Fortunately, dogs and cats alike prefer to nest or knead something soft before they go to sleep. Therefore, they may gravitate toward a covered seat. One benefit to owning leather is that it is easy to clean. All you need to do is wipe it with a cloth on a weekly basis. If your animal sheds or drools, it may be a good idea to wipe the couch down once per day. It may also be a good idea to use a product such as Febreeze or another deodorizer to get rid of tougher odors. No matter what type of furniture that you have, it is always a good idea to keep your pet’s nails trimmed. In addition to keeping them healthy and comfortable, trimmed nails are less likely to scratch the leather. For those with cats, it may be possible to cover their nails instead of cutting them. Most leather furniture providers will give you a warranty or some sort of service plan when you buy a couch or another piece. If you don’t have a warranty or service plan from the manufacturer, you can get one from your local leather repair service. Having your leather inspected and repaired promptly can prevent small scratches or gouges from becoming larger problems. If you like leather, there is no reason not to furnish your home with it. 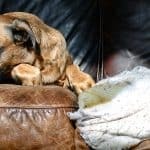 Although having a pet can be messy at times, there are plenty of ways to make sure that both your furry friend and your couch can live a long and happy life together. Contact Leather Medic if you have any questions regarding leather maintenance of restoration.